Saturday, December 29, 2018 was a joyous day for the families of Comr. Egwabor Isaac Ejime of Agbor-Nta in Ika South LGA, Agbakedio Michael of Ikpide-Irri in Isoko LGA and Hon. Dcn. Moses Ovie Etume (Omokpolekpo I) of Oghara-Iyedo in Isoko North LGA, all of Delta State, as their twin children gracefully formalized their relationship in Holy Matrimony. 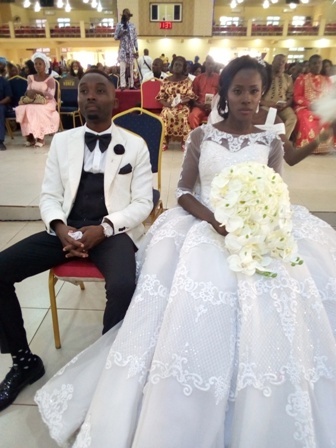 The twin brothers, Marvis Onyisi Egwabor and Marvin Ejime Egwabor in separate interviews said they met their spouses in Delta State University, Abraka some years ago. 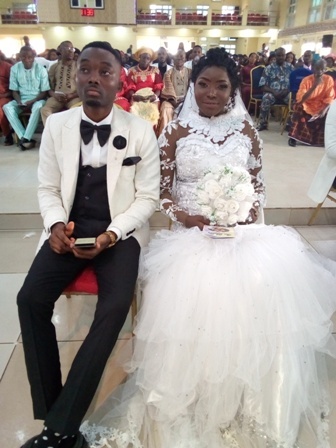 For Mr. Marvin Ejime, who spoke about his wife, Mrs. Sophia Eloho Egwabor (nee Etume), “I feel so happy marrying my heartthrob, whom I met years ago at the Delta State University, Abraka, during my SUG campaign for a senatorial position in the Faculty of Science. He went on to explain what he termed pillars of a successful marriage. One of such pillars he said is transparency, warning against secrecy in marriage by any of the partners. “It is when people begin to do hide-and-seek in their marriage that they start building mistrust and problems,” he said. At the reception held at Ogbemudein Mixed Secondary School, Agbor, there was enough for the mammoth crowd that honoured the occasion to eat and drink.